Jaipur: The Reserve Bank of India’s (RBI) chief said that the rupee has depreciated "quite significantly" in the last few months pushing up import costs, in comments that suggest the central bank’s growing discomfort with its recent slide. The rupee had fallen 5.9% in September and is down more than 10.5% since a 2011 high of 43.855 reached in late July, making it the worst performer in Asia. Traders have suspected some RBI intervention in the past month to stem the rupee’s fall, but it was more to keep the losses in check rather than reverse the direction of the move. At 3 p.m., the partially convertible unit was trading at 49.15 per dollar, versus 48.95 on Wednesday. Bankers have also been vocal about a global shortage in dollar liquidity. “We are reviewing the situation and will take appropriate measures," Subbarao said after the RBI board meeting in Jaipur on Thursday. The RBI’s stated stance has been it does not intervene to determine the direction of the currency but only to smoothen volatility, but the falling rupee has pushed up oil import costs, negating the impact of the crude price fall. US crude futures fell $1 to $84.57 a barrel on Thursday ahead of the weekly oil figures from the US government and as trade data from China pointed to slower demand in the world’s second-largest oil consumer. Data earlier in the day, showed India’s fuel price index rose 15.10% in the year to 1 October, higher than the previous week’s rise of 14.69%. The monthly inflation data on Friday would now be crucial for firming views about the central bank’s likely monetary policy stance. Wholesale price index probably rose 9.70% in September from a year earlier, easing slightly from 9.78% in August, a Reuters poll showed. The RBI, which has raised rates a dozen times since mid-March 2010, is set to review policy on 25 October with majority of analysts expecting a 25 basis points increase in key rates. The governor reiterated the RBI’s stance of trying to contain inflation even at the cost of some short-term economic growth. “We are sensitive to the de-acceleration of growth and we are equally sensitive to the persistence of inflation. 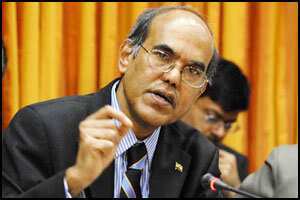 So we have to weigh growth and inflation concerns," Subbarao said. “When inflation runs as high as 9.8%, it is difficult to bring it down without compromising on growth. So we are trying to trade-off at this time on bringing down inflation even if it means bringing down growth," he added. The RBI has been among the most aggressive central bank’s across the globe. In recent times, that has put it in conflict with the government which now wants the central bank to press the pause button to protect growth. “We are aware that some central banks in Asia and some outside Asia have reversed...Those circumstances are quite different from ours," Subbarao said.